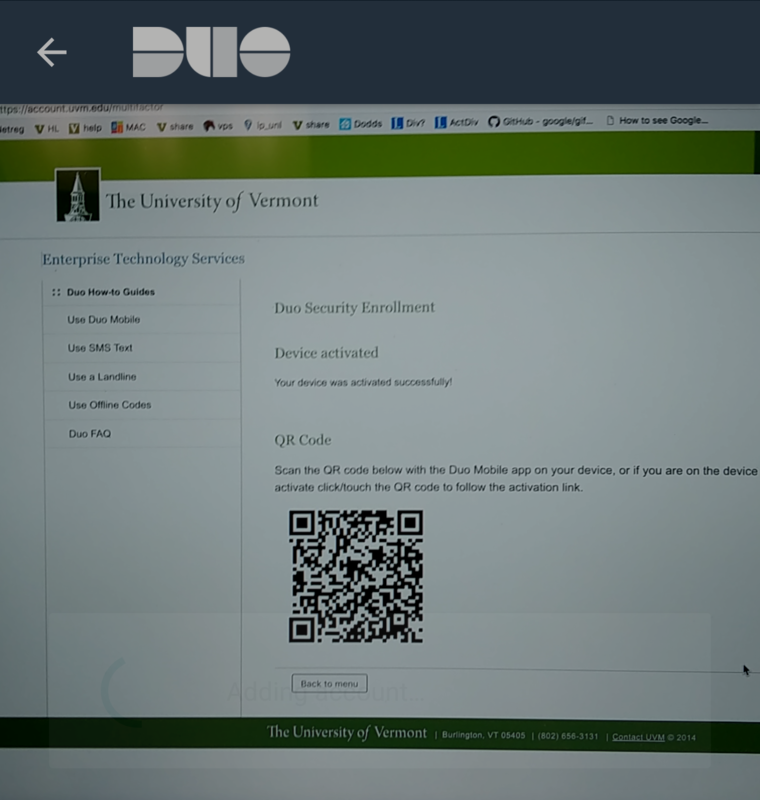 Duo Security is a multi-factor authentication tool used by the University of Vermont to protect sensitive information. 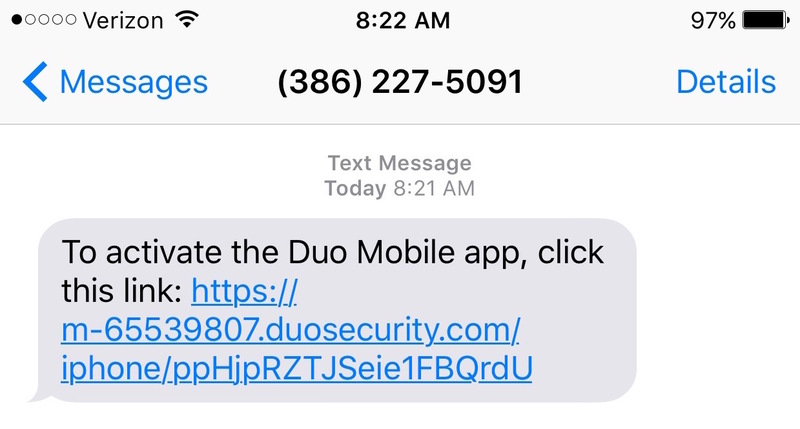 Upon logging into a Duo-protected site, you will be required to perform an additional authentication step via Push notification to a smart phone or tablet, SMS text, or phone call. To use Duo you must enroll a device to act as your second authentication factor. Please use the guides below to enroll the device(s) that best suites your needs. Enterprise Technology Services recommends enrolling at least two devices. There are five physical devices that you can use to provide the second factor of two-step authentication. Each device has one or more authentication methods available. Expand the toggle below to view all supported devices and authentication methods. Mobile phones with SMS text messaging capability. A printed list of 10 passcodes that can be used when other MFA options are not available. A “YubiKey” hardware token provides two-step codes at the push of a button. Your smartphone needs to be connected to the internet. 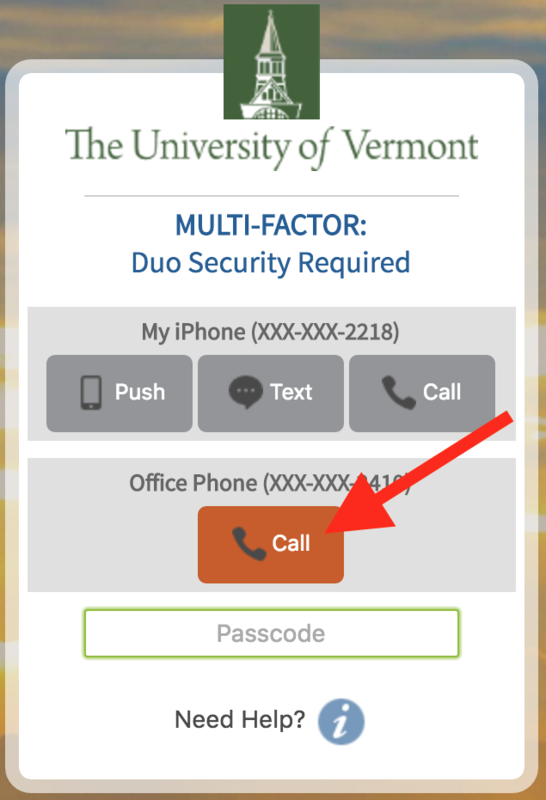 If you are on campus, you can connect your smartphone to the UVM wireless network. If you’d like to connect your phone or tablet to the UVM wireless network, please see this guide. Open a web browser on your computer and navigate to https://account.uvm.edu/multifactor. 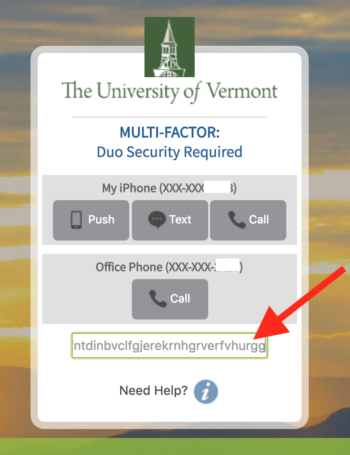 You may be asked to enter your UVM NetID and password. If you’ve previously enrolled a device in Duo, you may receive a prompt asking you to use your currently enrolled MFA device(s) to access this page. If none of your second factor devices are available, please contact the Tech Team (802)-656-2604 for additional options. Click the “Activate/Manage Duo Security” button. Click the “Add Device” button. Select “Mobile” for the type. Select the appropriate platform, enter your phone number (with area code), and enter a nickname for your phone. Then click the “Add Device” button. You’ll receive two sms text messages. The first message contains a link to download and install the Duo app on your device. Follow that link and install the app if you haven’t already installed it. If you have not already installed Duo you can click this link to launch your App Store (iOS) or Google Play store (Android) to install the app. 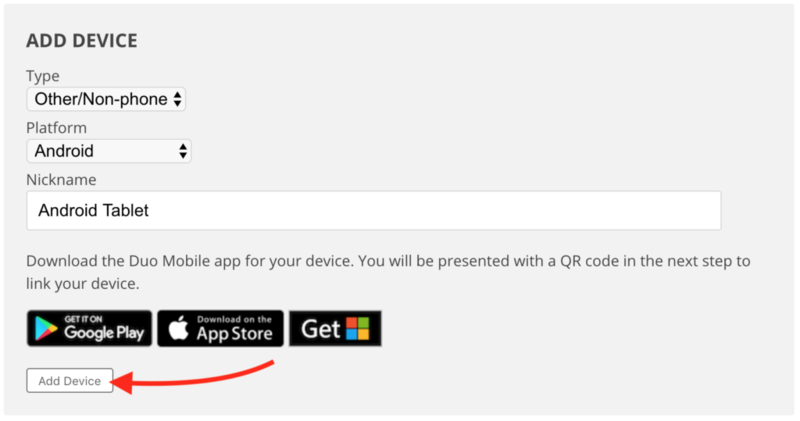 Once your device’s App Store (iOS) or Google Play store (Android) has launched, click the “Get” or “Install” button to download and install the Duo Mobile app. The Duo mobile app uses Push notifications. If prompted, you should “Allow Push Notifications” in order to use the Push authentication method. When the Duo mobile app installation completes, open the second sms text message you’ve received. 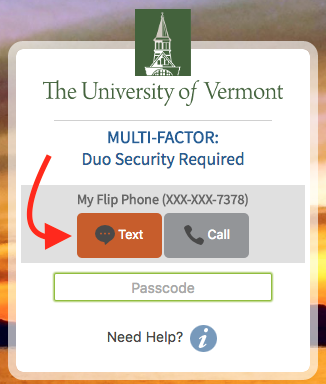 This message provides a link which will activate your Duo mobile app for use with your UVM account. Click the link to activate your Duo mobile app. At this point you should be able to use Duo to access multi-factor protected services. Still not receiving push notifications from Duo Mobile? Click this link for help troubleshooting Duo Push notifications on Google Android. Click this link for help troubleshooting Duo Push notifications on Apple iOS. 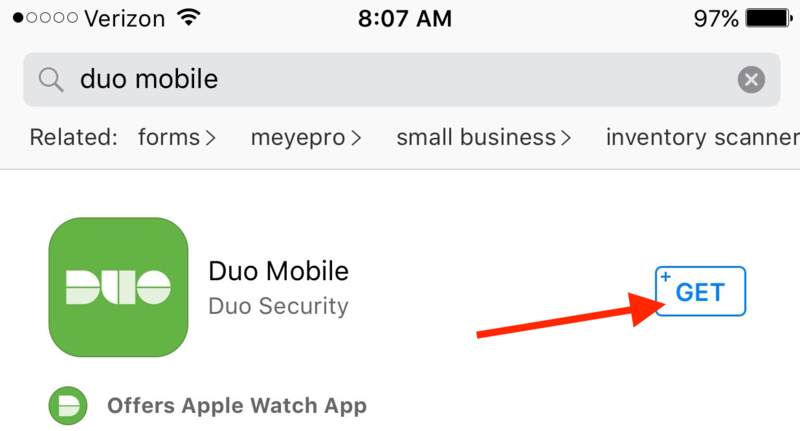 The following steps will guide you through enrolling your iPad or Android tablet in Duo Security for Push and passcode authentication. Your tablet needs to be connected to the Internet. If you are on campus, you can connect your tablet to the UVM wireless network. Navigate to your tablet’s App Store (iOS) or Google Play Store (Android). Search for the Duo Mobile app and install it on your device. If prompted, you should “Allow Push Notifications”. When the app is installed, proceed to step 3. Select “Other/Non-phone” as the type. Select the appropriate platform, and enter a nickname for your tablet, then click the “Add Device” button. A QR code will appear on the following screen. This code will be used to link your Duo Mobile device with your UVM account. On your tablet, open the Duo Mobile app. Tap the icon in the upper right corner. Duo Mobile may ask for permission to access your camera, tap Allow. The camera is used to scan the QR code. 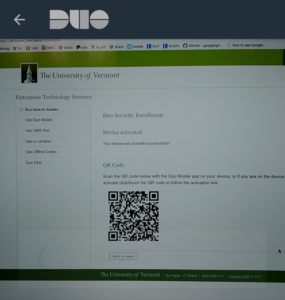 Point your tablet’s camera at the QR code, this will associate your UVM account with the Duo Mobile app. The following steps will guide you through enrolling your cell phone in Duo Security for SMS authentication. Select “Mobile” as type. Select “Unknown” for platform, then enter your phone number (with area code) and a description of your phone. Then click the “Add Device” button. Your phone should now have been properly added to the Duo Security system. Select “Landline” for type. Enter your phone number (with area code), your extension (if you have one), and a description of your phone. Then click the “Add Device” button. Note: You must enter a 10 digit phone number including the area code. That’s it! You’ve successfully enrolled your Landline phone for use with Duo Security. Off-line passcodes are to be used when you need to provide an additional authentication factor but are unable to use other methods. Click the Generate Offline Codes button. Print out this list of codes and keep it in a safe place. You should treat these codes as if they were a $100 bill. Codes must be used in the order they are listed. Once you’ve used a code it will no longer work, cross out any used codes to help keep track of which have been used. 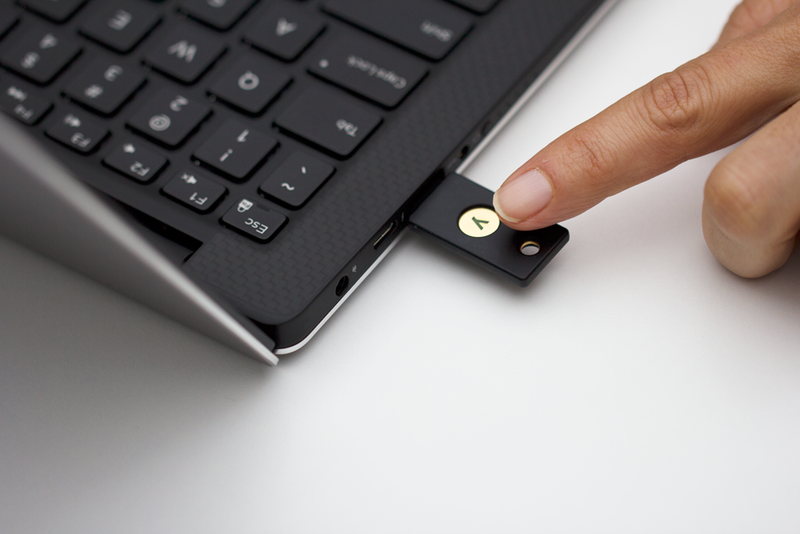 A YubiKey is a small device that resembles a USB flash drive, plugged into the computer you are using to access a Duo protected service. Pressing the button on the key provides the second factor to the service allowing you access. To request a YubiKey, you will need to contact Identity and Account Management (iam@uvm.edu) to have one provisioned for you. There is a $40 one-time-fee to your department for each YubiKey. If you have not already enrolled your smart phone please see the guides for Enrolling Devices above. 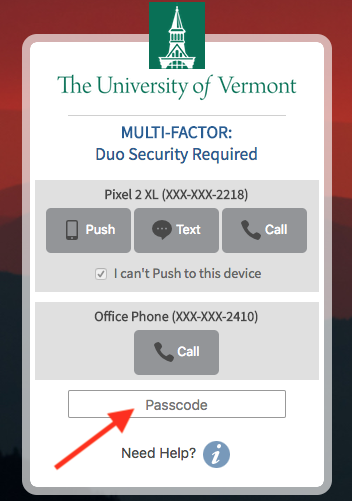 Open a web browser and navigate to a UVM web service protected by Duo multi factor authentication. In this example, we’ll be logging into PeopleSoft. 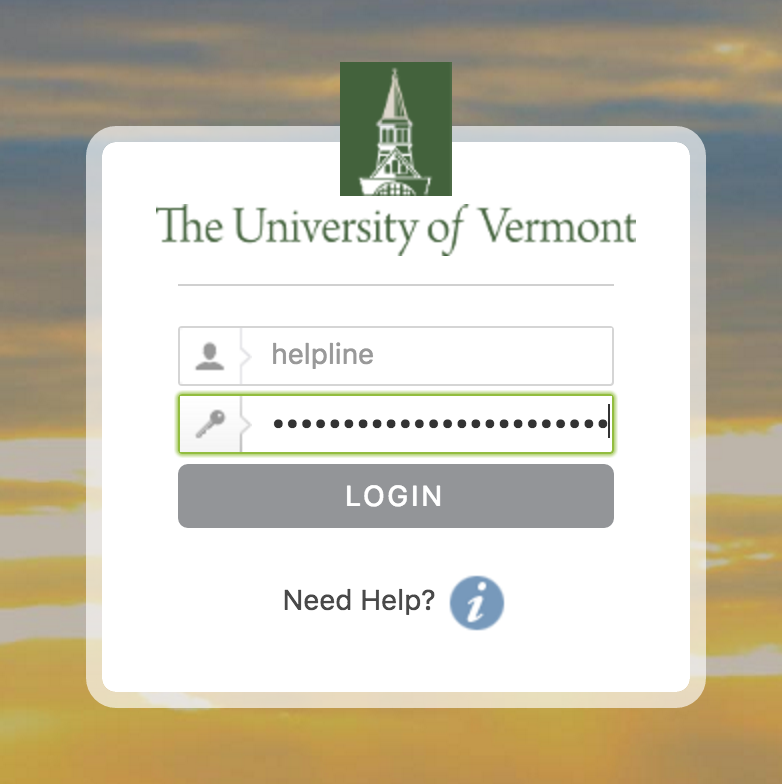 Enter your UVM NetID and password as you normally would when accessing other UVM web services. Upon entering your credentials successfully, you will be prompted with a “Multi-Factor Duo Security Required” screen. Clicking the “Push” button will send a no-cost notification to your phone’s Duo Mobile app. 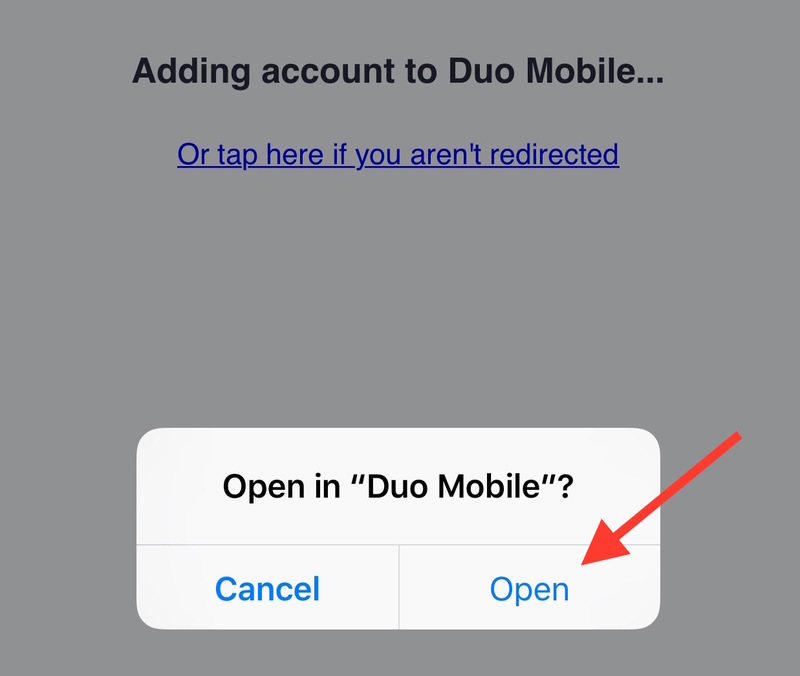 Open the Duo mobile app on your phone and tap the “Request Waiting. Tap to respond…” notification. Approve the login by taping the “Approve” button. That’s it, you should now be logged in! 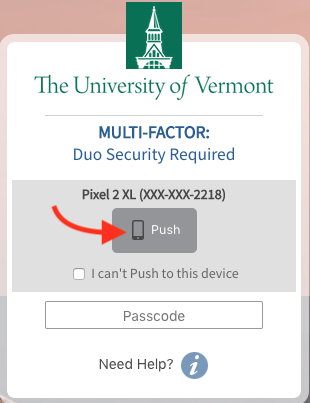 If you do not receive a push notification from Duo, check to make sure your phone has a good wifi signal and is connected to the UVM wireless network. If you do not Approve the Duo push notification within 20 seconds, it will expire. If this happens, please login to re-authenticate to the page and try again. Open the Duo Mobile app on your smart phone or tablet. 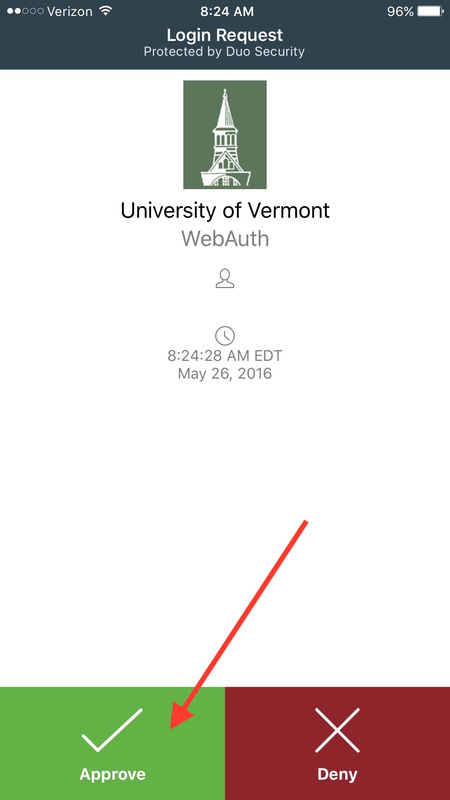 Tap on the University of Vermont icon, a six-digit passcode will be generated. Enter the passcode generated by your Duo Mobile app in the “Passcode” field, then press the Enter key. If you have not already enrolled your SMS capable phone for use with Duo, please see the guides above. Upon entering your credentials successfully, you will be prompted with a “Multi-Factor Duo Security Required” screen. Click the “Text” button. If the ‘Text’ option does not appear, you may need to select the “I can’t push to this device” checkbox. 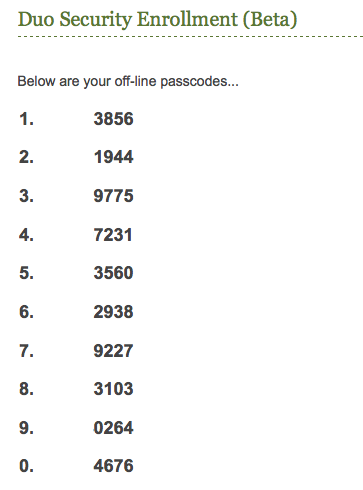 You should have received an SMS on your cell phone with a long list of codes within a minute. If you have not received this message, you may want to ensure that you have cell phone service and are able to receive text messages. You should only need to click the “Text” button on your computer once. The codes will be separated with a space. Each code can only be used once, so make sure to keep track of the last code used. Enter one of the received codes into the “Passcode” field, then press the Enter key. 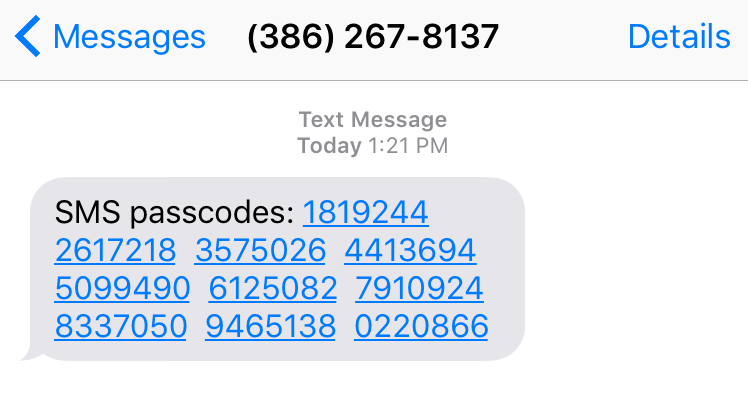 All codes in the text message are valid until used once. Codes may be used in any order without invalidating other unused codes. All codes become invalid if another batch of codes is sent by a new text request. If you have not already enrolled your office phone or landline number for use with Duo, please see the guides above. The specified Landline number will receive an automated phone call. Answering the call will inform you that a request was made to login to your account. To approve the login request, press any key on your phone’s number pad. That’s it, you’ve successfully logged into a Duo protected site using your Landline! To use a Backup Access code, navigate to a Duo protected service such as PeopleSoft, enter your NetID and Password. Enter the code on the Passcode field, then hit the “Enter” key on your keyboard. All offline codes are valid until used once. They may be used in any order without invalidating other unused codes. All codes become invalid if another batch of codes is generated. If you do not already have a YubiKey, you will need to contact Identity and Account Management (iam@uvm.edu) to have one provisioned for you. There is a $40 one-time-fee to your department for each YubiKey. Upon entering your credentials successfully, you will be prompted with a “Multi-Factor Duo Security Required” screen. Insert your YubiKey to a USB port on your computer, then touch the brass contact. Your YubiKey will automatically insert a string of characters which will serve as the second-factor for accessing the Duo protected service you’re logging into. That’s it, you’ve successfully logged into a Duo protected service with your YubiKey.